Life's little details...: Happy Halloween! I cannot believe it is this time of year again. Time seems to be slipping by faster and faster. I am excited to welcome in the holidays this year. I am trying so hard to revive my holiday spirit. Working in the retail world can put a crimp in it, but I have to remind myself I have the power to put in back. So I am going to enjoy, and savor this holiday season. 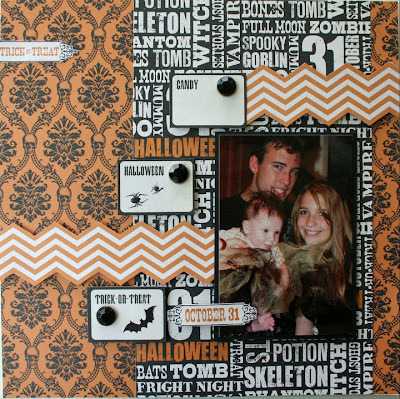 To kick it off, here are a few Halloween projects featuring Teresa Collins Haunted Hallows line. 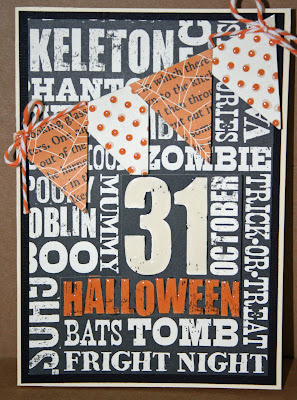 The first two are some cute little cards to give include some Halloween fun for the older kiddies in my family. I love Teresa's line for this reason. Not only does it really capture a Halloween feel, but it's classy and sophisticated. It is so fun to work with! In the layout, this a picture from last Halloween. Wesley and Breanna had fun dressing up and including Peyton in their fun. It was her first Halloween. They all looked so cute. Miss P, as we call her, has her Uncle Wesley wrapped around her little fingers! Breanna adores her as well, what's not to adore? If you would like to see a little more Haunted Hallows fun, click on over the the DT blog...I have a few other projects featured over there! Hope you have a very spooky Halloween!